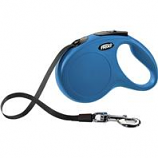 Flexi retractable leashes give your dog the feeling of freedom of movement it needs. Recommended for dogs up to 110lbs. Comfortable braking system. Sturdy tape 16ft. . .
5mm tape leash recommended for dogs up to 33 pounds. Reflective components. Chromed snap hook. Short-stroke braking system. Can be customized with led lighting system and multi box sold separately. 3mm tape leash recommended for dogs up to 26 pounds. Reflective components. Chromed snap hook. Short-stroke braking system. Can be customized with led lighting system and multi box sold separately. 5mm tape leash recommended for dogs up to 55 pounds. Reflective components. Chromed snap hook. Short-stroke braking system. Can be customized with led lighting system and multi box sold separately. Recommended for dogs up to 55lbs. Comfortable braking system. Sturdy tape 16ft. . . 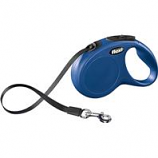 Features highway grade reflective sheeting on both sides of the leash.16 ft in length. High intensity prismatic sheeting is applied with weatherproof permanent adhesive.. 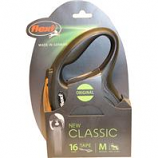 Provides enhanced visibility and improved safety.. Includes a braking system that can be activated with just one hand.. Includes a durable swivel clip..
• Up To 45 Pounds. • Up To 25 Pounds. • Up To 45 Pound. • Up To 110 Pounds. • Up To 65 Pounds.